This is the famous Ligne Roset "Maly Bed" that you see in virtually every designer magazine. I decided to check it out and see how cool it was in person. The answer is that it's pretty damn cool, but it has a few drawbacks. There is no fixed headboard on this bed. Instead there are movable back cushions that you can rearrange as needed. It also comes with optional pivoting tables. And the design, as you can see, is to die for. Simple. Elegant. Stylish. The biggest drawback I saw is that the pivoting tables are not movable like the back cushions, and they're also not removable. If you're like me and you get up frequently and toss and turn a lot, that makes them very awkward obstructions most of the time, which rules out this bed. Too bad, too, because otherwise I like it a lot. The $5,000 price tag also seems a bit much for what you get. This picture was taking at the Ligne Roset store in New York, N.Y.
How do the Moveable/removeable back/side cushions attach? 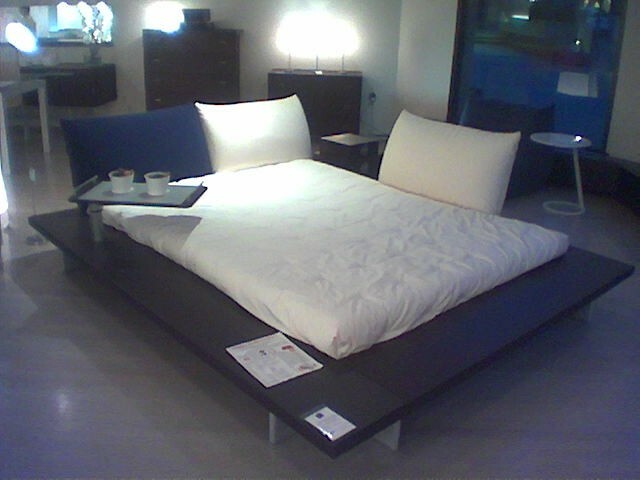 I have seen multiple pictures of this bed but none of them show how that works? As I recall they're attached to wooden slats that fit into slots around the outside of the bed. You forgot to mention that the mattress acts as a chaise lounge in that one end angles up and down. Also the side tables are extra and the cushions have very ridgid pvc panels that click into channels along side the mattress. I own this bed. I would not recommend. When purchased they will assemble the bed for you, but I have just moved and uppon further examination the boards around the bed are particle board, with l wood covering. For the $5,000 frame that this cost, it should be solid wood. Also, it is very large and only a Queen. For $5,000, ditch the name brand and hire someone to make a replica with quality wood. Also the high quality foam they speak off, is not high quality...it is in fact made of cheap standard yellow foam that ages poorly, after 5 years I would give the quality a very poor rating. This company spends all of it's money on store locations, like the one is SOHO ,and the fact that it is made in France, which does not mean quality. Trust me I am in design and the work we get from China is much better and cost a fraction of the French work. DO NOT GET!